More than almost any other musician, Bob Dylan has constantly reinvented his songs for live performance. If you read interviews with people who have performed as part of his band on his Never Ending Tour, for example, they talk about Dylan playing songs in a different key and with a different tempo every night of a tour, just to see if the band can keep up. I’ve seen Dylan audiences completely mystified about what song might be being played until he sings the first lines that are recognizable. Hell, I’ve been mystified. While the 1966 featured a lot of new versions of old songs (mostly acoustic songs turned into electric ones), it was the 1974 tour with The Band where he really began to transform his repertoire. Listening to one of his Madison Square Garden shows on the walk home today I was struck by how hard it would have been for me to sing along to a song like “Lay Lady Lay”, where his phrasing was totally transformed, to the point that certain words actually change lines. One of the best examples of Dylan’s approach to the tour was “Most Likely You Go Your Way (And I’ll Go Mine)”, the first song on the third side of Blonde on Blonde. Listen again to that version. It’s a quaint little song that has a bit of swing to it. Dylan eases the lyrics out. It’s soft-spoken, and a just a touch goofy because of the trombone. 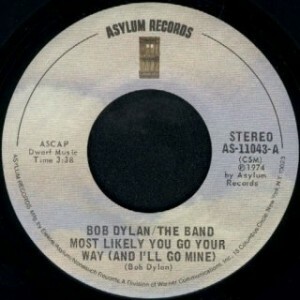 Dylan used this as his encore of the first show on the 1974 tour in Chicago, after The Band had done “The Weight” as an encore. 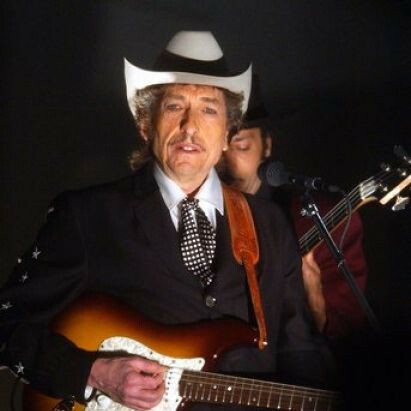 After some early experimentation, the 1974 tour found a reasonably familiar format: Dylan and The Band together for a half dozen songs, The Band without Dylan for five, Dylan’s return for three, intermission, solo Dylan, Dylan and The Band again, Dylan leaves again, Dylan returns again, encore. Anyway, for the first show “Most Likely You Go Your Way” was the final song. Then it drifted away, returning to the encore in Philadelphia, and then to the opening slot in Toronto. By Montreal (January 11) it had the unusual position of both opening and closing the show. Dylan played it with such great energy, that it launched the show on a strong note and then closed it down on that same note. I have to say, that’s a new one to me. I have, on very rare occasions, seen bands play the same song twice because the audience response was so strong and they’d run out of material. This wasn’t the case with Dylan, who had rehearsed eighty songs for the tour, and played dozens of different songs as things were rotated in and out. The vast majority of shows on the tour (maybe thirty – I didn’t bother to count) featured two versions of this song, most frequently as the opener and in the encore (some shows follow this in the encore with “Blowin’ in the Wind”, but most don’t). I rate this song very highly, and it is because of this tour. Had Dylan never done this after Blonde and Blonde it is not likely that I would recall it at all, but it is powerful as done here. The version that is included in Before the Flood (as the opening song on the two-LP set, and also released as a single that didn’t fare very well) is the opening song from the final stop on the tour, at The Forum in Inglewood on Valentine’s Day. It seems to be typical of the way that the song was being played on the tour, if a little faster than the versions from early on. They’ve turned into a hard-charging anthem. It’s a really great rendition of a fairly forgettable Dylan song, turned into something far better than what had been imagined eight years earlier.